I'm getting the crazy project for Stelios wrapped up. 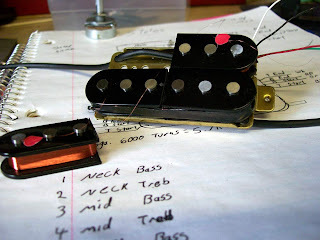 The quad coil bridge pickup is setting up in some epoxy right now. I recorded this little sound clip of the 2 coil neck pickup last night. It sounds good, very clean and clear. I had to really pump the gain to the little Valve Jr to get it to break up well. Stelios is a much better player than I am and I'm excited to hear him put it through its paces!